The Layer Properties editor or view lets you adjust the properties of a layer in the Timeline view The Layer Properties can be viewed as a floating window or as a view (docked). Each layer has its own set of properties that can be modified, including effect and peg layers. 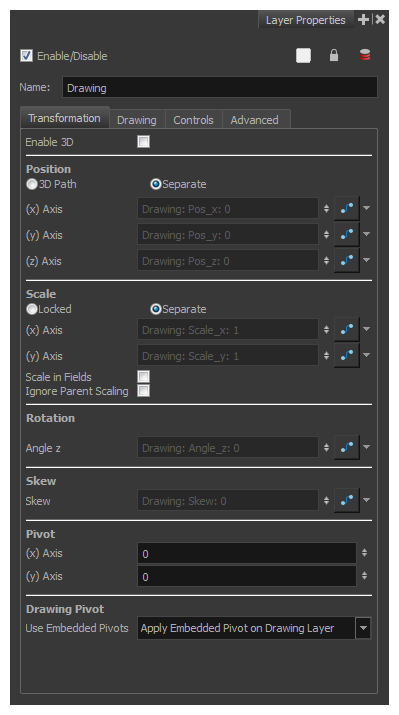 Display the Layer Properties editor or view if you want to modify some of the layer’s properties, such as the name or the antialiasing quality. NOTETo know more about the parameters displayed in the Layer Properties view, see Layers. From the top menu, select Windows > Layer Properties. From any of the other views, click the Add View button and select Layer Properties. Right-click on a layer in the Timeline view and select Layer Properties. Select a layer in the Timeline view and press Shift + E.